If you've left your fruit cake a bit late, never fear! These fruit cake wreaths are full of delicious seasonal mango and cherries as well as cranberries flavoured with whisky. 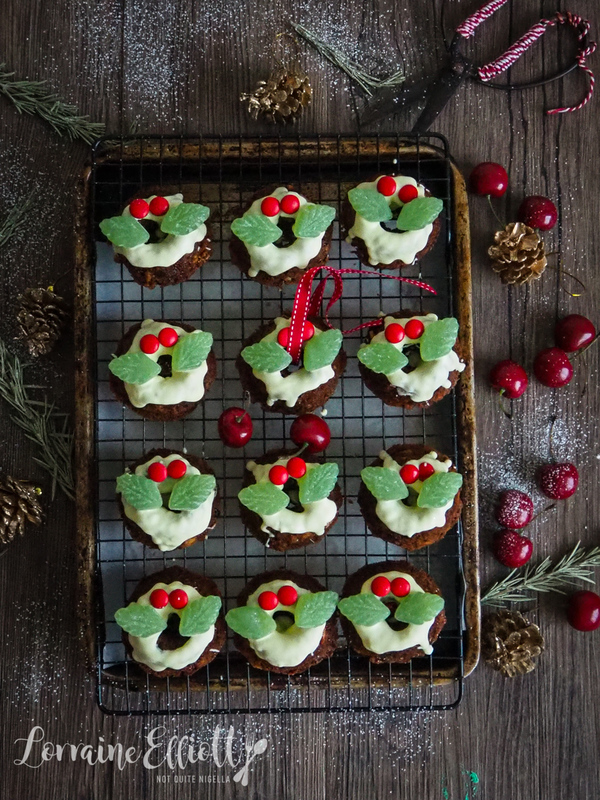 Making them in a mini bundt tin means that you can get individual serves that also look like wreaths! It's only just over week to go until Christmas and I'm craving Christmas cake. Every year we usually get a few of these for Christmas as my parents get given them and they hate fruit cake. But quite honestly I could not wait a week for it and I wanted to eat fruit cake now. 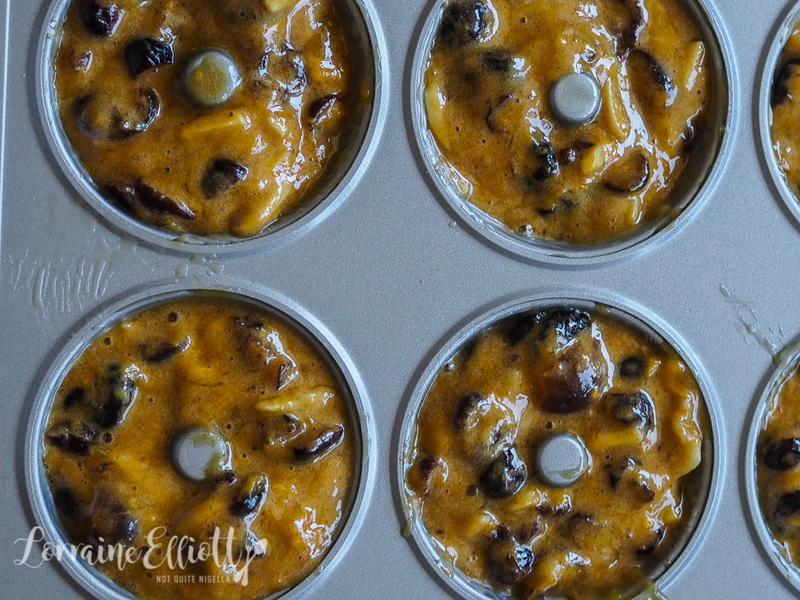 And for me and fruit cakes, the more fruit the better and given that we are in the midst of mango and cherry season, I decided to make use of these fruit in our fruit cake mini bundts. These also cook quickly because of the shape and you don't have to double line any tins with brown paper as you would a traditional fruit cake. They are pretty much just like any other cake except perhaps easier because it's just adding everything into a bowl and mixing rather than creaming. I don't know about you Dear Reader, but I'm looking forward to relaxing over the Christmas break. I've got a true crime book to read, some podcasts to listen to and tv shows to watch and we may even see a movie or two. Last week we went to the movies with Nina and Garth to see a new film called The Disaster Artist. It's a movie based around the making of a 2003 film called "The Room" which is said to be one of the worst movies ever made or "the Citizen Kane of bad movies". It was financed, written, directed and starred by a mysterious man called Tommy Wiseau. Tommy claimed to be in his 20's during the making of The Room and said that he was from New Orleans. However he looks like he is in his 40's and has a vague Eastern European accent. The plot, script and acting, particularly from Tommy is incoherent and it was rumoured to cost $6 million USD. All of these things, plus the fact that it is hilarious in a cringey way turned into a cult film. Movie theatres hold regular sold out screenings that involve a high degree of audience participation with plastic spoon throwing and reciting of lines. James Franco produces, directs and stars in this and he makes a convincing Tommy Wiseau with hair flicks, accent and strange laugh. I loved it because it was unexpectedly uplifting and didn't really make fun of Tommy Wiseau who might have some issues. It really made us sympathetic to this man who just wanted to play a hero but was told that he would always be cast as the villain simply because of the way he looked. 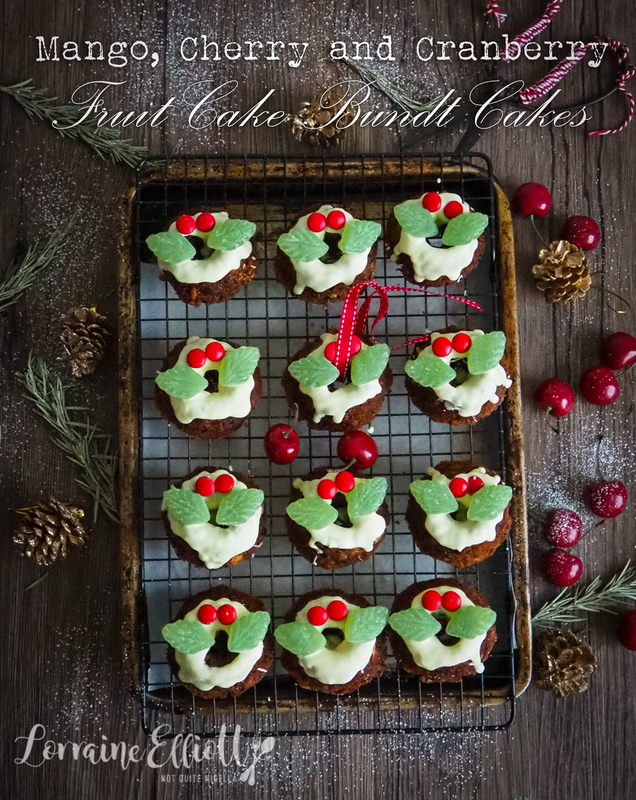 So tell me Dear Reader, do you like fruit cakes? And do you prefer more fruit or more cake in yours? What have you got planned over your Christmas break? And have you seen The Room or The Disaster Artist and what did you think of it? Step 1 - Brush the cavities of a mini bundt tin with the melted butter and then place the tray in the fridge to set the butter. In a saucepan place the dried fruit and glace cherries with whisky and water. Bring to a boil and then simmer for 5 minutes. Remove from the heat and allow to cool. Add the mango flesh to the saucepan. Step 2 - Preheat oven to 160C/320F. In a food processor (or you can do this with your hands in a large bowl), blitz the butter and marzipan into the flour until it resembles fine sand. Add the brown sugar, bicarb, vanilla and spices. Fold in the fruit along with the liquid and mix in the beaten egg. Step 3 - Spoon into the buttered cavities. Bake for 30-35 minutes. Cool completely. Step 4 - Melt the white chocolate in a microwave and then mix with the coconut oil. Spoon over the cooled bundts. When the chocolate has started to set, place the red M&Ms and the peppermint leaves. recipe"Santa Baby" Angel Food Cake! recipeCherry Ripe Snow Beanie Christmas Cake! recipeElsa, The Amazing Red Wine Chocolate Cake for Christmas! recipeJoy, The Cherry Blossom Checkerboard Cake & A Nine Year Blogsoversary! recipeSticky Date Bundt Cake With Butterscotch Sauce! recipeGet Happy With A Funfetti Pound Cake! recipe "Santa Baby" Angel Food Cake! 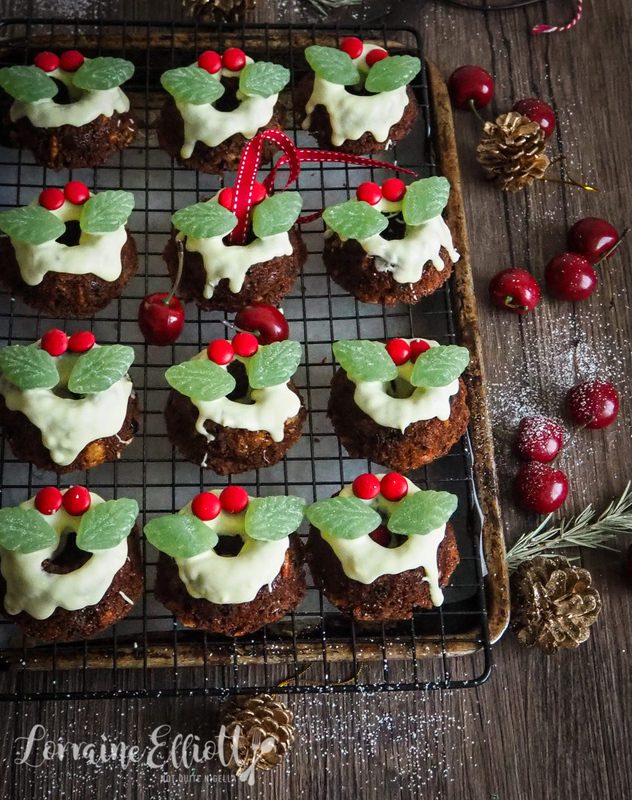 recipe Cherry Ripe Snow Beanie Christmas Cake! recipe Elsa, The Amazing Red Wine Chocolate Cake for Christmas! recipe Joy, The Cherry Blossom Checkerboard Cake & A Nine Year Blogsoversary! recipe Sticky Date Bundt Cake With Butterscotch Sauce! recipe Get Happy With A Funfetti Pound Cake!